Although it's a task that pops up infrequently in my life, getting an "official" photo for a passport or visa seems a bit of a rip-off, especially in today's digital camera age. Come on, why should I have to schlep down to the post office, UPS store or other "official" passport photo center and pay $10+ for a 2"x2" photo? Turns out, now there's a better...and cheaper...way: ePassportPhoto. ePassportPhoto is a FREE online service that lets you upload, edit, and print your own passport photos from the comfort of the nearest computer. There are simple, step-by-step instructions for taking your photos, including tips like "make sure the subject has a neutral expression with no teeth showing." Who knew the U.S. government actively discouraged smiling? The site also publishes an insightful article that reveals what the big chain drugstores don't want you to know about passport photos, including what a giant cash cow the service is for their businesses. Um, no thanks, I'm trying to cut down on the red meat these days. Smile (on second thought, don't), for ePassportPhoto. I'm somewhat of a fanatic when it comes to finding the best airfare deals. When I'm planning a trip, I've been know to check (and re-check...and re-check) the various reservation web sites to see if fares have slipped by $50 or whether I can nab a last-minute airfare special. But my days of obsessively monitoring airfares may be coming to an end with my discovery of Yapta. Yapta (which stands for "Your Amazing Personal Travel Assistant") is a handy online service that makes it easier to find the best airfare deals out there. First, install Yapta for your favorite web browser (available for Firefox and Explorer) and then start searching for fares on any of the dozen or so websites supported by Yapta. Once you find a flight that interests you, simply “tag” it and Yapta will automatically begin monitoring its price for you. Should the price drop, Yapta will automatically email you a notification about the new fare. Already bought your ticket? Yapta can also monitor your flights and let you know if the fare drops and tell you whether you’re eligible for a refund from the airline. Hmmm. Looks like I’m going to have to find a new travel obsession. Whenever I check in for an airline flight, I'm always amazed by the people I see lugging several HUGE pieces of luggage. What could they possibly be carrying in there? Are they going on a trip that will last several months? The truth is, most of these travelers simply can't imagine leaving home without taking along all the comforts of well, home. Now I admit, I'm a bit of a gypsy (Hungarian being my ethnicity) and have been known to pack WAY too much for a trip. "What if it's unexpectedly cold? ", I worry. "Maybe we'll be going out to a fancy restaurant," I fret. "What happens if I spill something on my shirt?," I wonder. But ideally, I try to pack only what I can carry on board my flight (carry-on vs. checked luggage is an ongoing debate in my household, I might mention). Thankfully, One Bag is there to help. Compiled by Doug Dyment, One Bag is an exhaustive resource for those looking to travel light. This comprehensive web site is chockablock with great advice on how to reduce your luggage to a more manageable size. Doug not only shares his philosophy on why packing light will enhance your enjoyment of traveling, but he also makes suggestions on what to pack, the best luggage choices, efficient packing, and more. There's even a a suggested packing list to help get you started. Go forth and travel light. This applies to air travel between the United States and Canada, Mexico, the Caribbean, and Bermuda. In case you haven't heard, the U.S. recently changed its policy and now requires all American citizens to carry passports when traveling by air to Mexico, Canada, the Caribbean and Bermuda. This new policy has created major delays at the U.S. Passport Office thanks to a surge in passport applications and renewals. Even if you're not traveling to one of countries mentioned above—but your passport is expiring anytime soon—this could have a huge impact on your international travel plans. 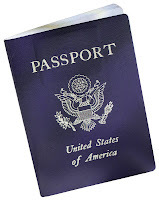 People report waiting up to 12 weeks to receive a new or renewed passport. Horror stories of long lines, disconnected phone calls, cancelled trips and other annoyances abound. Even if you're traveling in say, October, and your passport doesn't expire until December, you may still be affected. For instance, many countries require that your passport be valid for a specific amount of time AFTER you enter the country. For instance, Greece requires that a traveler's passport be valid for at least three months beyond length of stay. Morocco requires six months of validity. To check out the passport requirements of your international destination, go here, navigate to the correct country, and then select "Passport/Visa" from the right-hand menu. What are you waiting for? Go check your passport...NOW! Does this sound familiar? You call a travel company to book a trip, make a complaint, request information, check on a reservation, or do some other relatively simple task, and suddenly, you're stuck in PHONE TREE HELL! It's that maddening world of endless phone prompts, droning announcements, and countless button pushes that get you nowhere...except to yet another recording. There's no escape! Thankfully, the gentle folks at GetHuman offer some relief. This handy-dandy online database details the phone numbers and secret button combinations you need to dial to get connected directly to an actual human being. There's even a special Travel section on the site listing airlines, hotels, and other travel-related businesses. For even more "secret" phone numbers (travel related and otherwise), be sure to also bookmark the appropriately named Hard to Find 800 Numbers. Here you'll find additional tricks for getting through those endless corporate phone mazes. With two months since my last post, you'd be forgiven for asking yourself the same question about the Travel Coach: "Where in the world have you been?" And thanks to the handy Travbuddy Travel Map, I have a ready answer for you: Everywhere! In addition to helping you hook up with fellow travelers, and share your travel stories, the Travbuddy web site also lets you create a global map that shows graphically where in the heck in the world you've visited. So where in the world have YOU been? With the rush of the holidays upon us, even the Travel Coach can forgive you for not thinking about your vacation plans for next year. But if you've got your heart set on camping at at one of our more popular (i.e. crowded) National Parks in the summer of 2007, now is the time to be reserving your favorite site. Because the National Parks Service opens up reservations for any given day five months in advance, some of the most popular summer time periods will become available over the next several weeks. 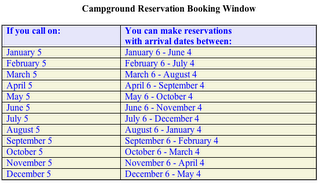 For instance, Memorial Day weekend (May 25-28) will be available for booking starting Christmas day. 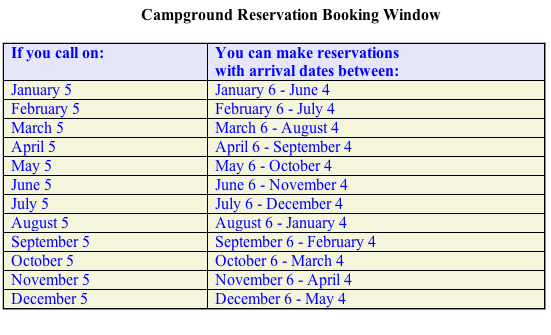 The handy-dandy table to the right (provided by the National Park Services) shows the crucial reservations dates for the entire year. For more information, including further reservations restrictions and to book your site, visit the online National Parks Reservations Service.